Don’t miss Round II of the Great Northern Barra Bash! Enjoy a day fishing in the Darwin Harbour & Shoal Bay while trying to catch the Million Dollar Fish! 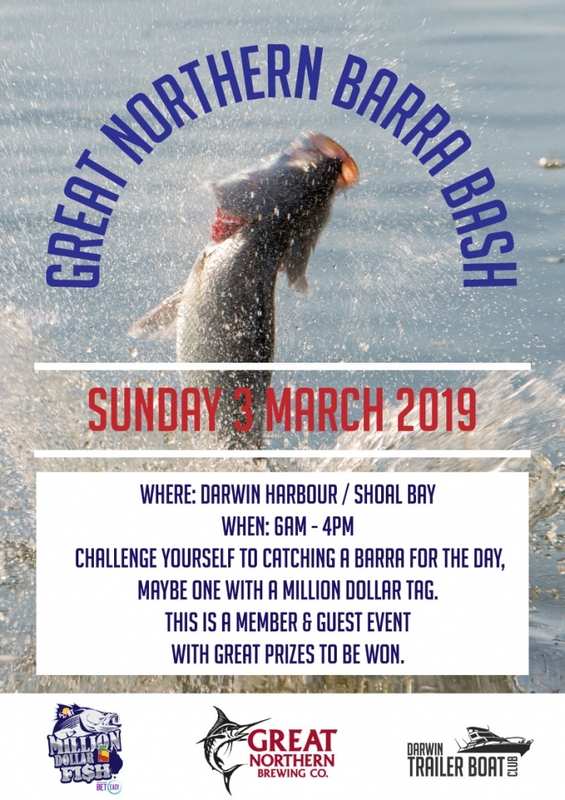 Join us for the “Great Northern Barra Bash – Round II” competition to be held on Darwin Harbour & Shoal Bay. Hit the Water at 6am & challenge yourself in catching a Barra for the day, maybe one with a Million Dollar tag attached. This is a Member & Guest event with Prizes to be won. Event is being held on Sunday 3rd March starting at 6am. Event ends at 4pm with competitors having to be back at the club by this time, Presentation will occur in the Conference room or under Green Sail area subject to weather. Competition is held within the confines of Darwin Harbour & Shoal Bay only. This event is a catch & release competition only, competitors can retain their catch for personal use per NT Fisheries procession limits & regulations. All Barra caught are to be measured & photographed on a brag mat via a digital camera device that can be used to confirm its size back at the Club by 4pm (full fish must be in photo). Photos are then to be emailed to Club email address [email protected], they will then be judged & viewed. Winner will be judged by the longest fish caught on the day via photo proof presented by competitor, Barra must be of legal size 55cm to be eligible to be entered. This is a Club members & guest event only. A guest must be in the same boat as the DTBC member on the day. Fish must be caught by hook & line technique only, Bait or Lure are acceptable. Skippers are responsible for own safety of boat & crews on the day. Competition is run within the honesty & integrity by all competitors on the day per the rules set. Judges decision is final & no protests can occur after the winner is announced. Event is to promote & foster our Club’s values, it strongly encourages all Members plus their families to join in. Catch one with a RED tag & it’s your shout at the Bar. If you haven’t already, don’t forget to register also for the Million Dollar Fish Competition.